Earn 1 AIR MILES® reward mile for every $25 spent in a single transaction. AIR MILES® reward miles are only available on Cheques and related products. We are proud to offer our clients this extra incentive on manual and laser cheque orders, its our way of saying thank you to the individuals who have been willing to make the switch from their current cheque suppliers to use our services for the printing needs. We look forward to building relationship with you and your company over the years ahead! *All rewards offered are subject to the Terms and Conditions of the AIR MILES Reward Program, are subject to change and may be withdrawn without notice. 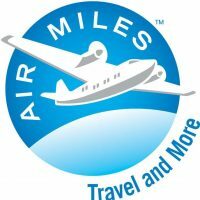 To redeem for Travel and/or Merchandise Rewards, you must have accumulated sufficient AIR MILES reward miles in your Dream Balance. Some restrictions may apply. Quantities may be limited. Collectors must pay taxes, fuel surcharges and other applicable charges and fees on air, hotel and car rental Rewards. Travel Rewards may be subject to a minimum advance booking and availability from participating Suppliers. No cancellations, exchanges or refunds for tickets, certificates or merchandise once booked or ordered. For complete details, visit airmiles.ca or call the AIR MILES Customer Care Centre at 1-888-AIR MILES (in Toronto) (416) 226-5171).